What is it they say? In like a lion, out like a lamb? This March is a bit backward, it seems. I began the weekend with the best of cooking intentions, but when Saturday and then Sunday dawned warm and sunny, they simply didn't make the cut. Other things did, like dog walking and lettuce planting and beach visits and an afternoon of wine and spinach puffs on a lovely Sandwich porch. Even car vacuuming and house cleaning snuck in there. But spending all day in the kitchen when March was offering 60 degrees seemed like a terrible waste. I don't have any regrets. I did manage, once Sunday wound down, to muster the energy for a simple carrot soup. The fridge was empty, after all; I'd eaten through a quart of my mother's homemade minestrone, nearly a cup of sour cream, and far more banana bread than ought to be legal. I had to make something, and carrot soup seemed the easiest thing. There was a pot of homemade chicken broth on hand, boiled down from the carcass of a bird we ate last week. I had several pounds of carrots still kicking around in the hydrator from goodness knows when, and lots of storage onions tucked away in the basement closet. 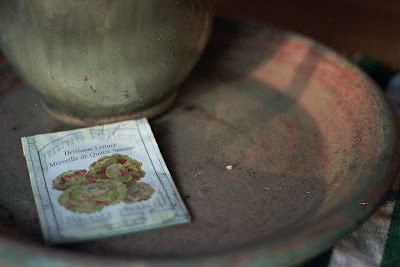 All that was left was a few sprigs of thyme, and they sat happily potted in the greenhouse outside. I cried an awful lot during the onion slicing, either because I knew the cold weather was to return today or because storing onions all winter somehow gives them a terrible ability to sting. I don't know which, but it was sort of cathartic in the end. The whole endeavor—melting butter, sauteing onions, carrots, and thyme, throwing in broth and a pinch of salt—only took about a half an hour, from start to bowl. It's not a demanding soup; you can empty the dishwasher, wash the knives and pots, and generally have most of the cleanup done by the time you're ready to eat. Late on Sunday afternoon, that's a very good thing. I always turn to Waters' when I want a meal that is easy to make, requires only a few good ingredients, and will be simple yet elegant all at once. 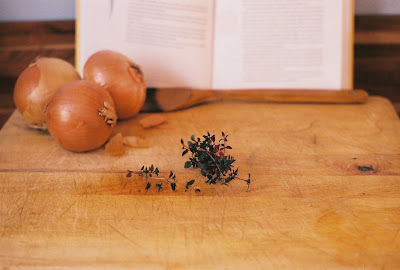 This soup is no exception, and beyond adding a bit more thyme, I really didn't change much. Melt the butter in a large, heavy-bottomed soup pot. Add the onions and thyme once it is hot, and sauté for about 10 minutes over medium-low heat, or until the onions are translucent and soft. Add the carrots and season with salt to taste. Continue to cook the vegetables together for another 10 minutes or so (Waters points out that cooking the carrots with the onions is important to build flavor, so don't skip ahead to the broth). Once they are fairly soft, add chicken broth and bring to a boil. Lower the heat and leave the soup to simmer for 10 to 15 minutes, or until the carrots are cooked to your liking. Serve hot with a good rustic bread and maybe a dollop of sour cream. Isn't it just wonderful? I love everything about it, too. It's delicate and hearty all at once, which is one of my favorite qualities in a food. Yesterday, I had some leftovers with a piece of sourdough. Delish!